Catering facilities on site, changing romos, pro shop with club, trolley and buggy hire. Mullion Golf Club situated on the cliffs of the Lizard Peninsula is not only the most Southerly but one of the most beautiful courses in the West Country. Framed by sandy coves and protected reed beds, the course, now well past it's centenary, has always attracted the literary giants who not only enjoyed the golf but also fascinated by the ambience. 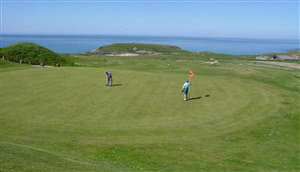 With course improvements and modern facilities added in recent years Mullion stands comparison with any rival for a testing and sporting day's golf.